A land and water grab is happening in the canyons and plateaus where I live in rural Utah. Several Canadian corporations backed by transnational investors are moving in to extract tar sands and oil shale on public lands. These outfits are the spear tips of a host of operators who are trying to strip mine the world’s dirtiest oil in the headwaters of the Colorado River, one of North America’s most endangered rivers. In a region already hit by more than a decade of drought, the mining corporations are drilling deep into underground aquifers to pump water for their processing operations. At the ranch where I work, the springs in the canyon downstream from the initial mine are drying up. The ranching family is one of the first to be impacted by the mine, but there are bigger implications, as waste discharged from the mines will impact more than 30 million people who rely on the Colorado River for drinking water and irrigation. And then there are the climate change consequences. According to industry backers, there are more potential fossil fuels in the Green River formation that stretches across Utah, Wyoming, and Colorado than the Alberta tar sands. If the infrastructure for these types of megaprojects is completed, there is an almost certainty of being locked in a path toward catastrophic climate change. With these stunning contradictions in mind, and with all legal options exhausted, local people and climate justice rebels took matters into their own hands in the summer of 2014 by establishing a resistance camp on the mine lease in order to halt mining operations. Amidst a summer of blockades, police repression, and the stresses of day-to-day rural resistance, it’s been a challenge to maintain a global perspective. It’s clear that our fight is being driven by capital and technical knowledge generated through the exploitation of the Alberta tar sands. It’s also clear that there are financiers intending to export these mining operations around the world using corporations deeply tied to the military industrial complex. But what are the strategic and tactical implications as to how we should carry out our struggle? What are our relationships and responsibilities to other communities fighting exploitative land grabs around the world? How can we use our collective power to fundamentally transform the political and economic structures that facilitate this ecocidal rush? While thinking through these questions, I came across a copy of Grabbing Back: Essays Against the Global Land Grab. This compilation is billed as an “illustrative field guide to the way people power responds to the global land grab.” It ranges from pieces written by voices new to me, like Yangtze River Delta Earth First!, to long time writers and movement elders, like Grace Lee Boggs, Max Rameau, Vandana Shiva, Noam Chomsky, and Silvia Federici. Editor Alexander Reid Ross starts the introduction by describing the global land grab as a contemporary phenomenon where large transnational corporations based in the North Atlantic countries, the Saudi states, and the BRICS (Brazil, Russia, India, China, South Africa) are grabbing millions of hectares of land from small farmers and indigenous people in Africa, South America, and Asia. By his estimate, the land grabs that have taken place around the world since 2009 would encompass the entire Western United States. Reid Ross describes five main origins for the global land grab as climate change, financial speculation, the Great Recession, resource scarcity and the ideology of ‘extractivism’1 and the history of colonialism. This collection is based on a “macro- and microanalysis of land-based struggles in constant tension with the principles and values of capital.” It takes the reader on a far-ranging journey of reading global capital politically by examining the drivers of dispossesive and violent conflict around land use. 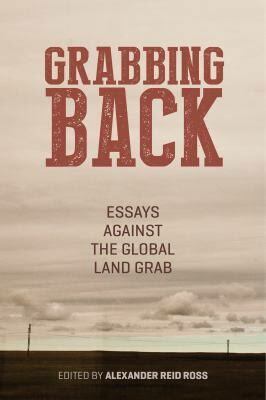 Grabbing Back is edited in a dialectical manner, weaving between describing the causes of contemporary land struggles as well as introducing us to the people fighting to defend their land and construct ways of life that subvert capital’s logic. The approach of combining writings from frontline conflicts and academic authors gives the reader a bird’s eye view of the issues as well as a fine-grained picture of reality on the ground. The best articles of the collection are reflections by seasoned organizers and street fighters looking back on recent years of struggle while explaining how their thinking is evolving. AK Press has been putting out several of these sorts of collaborative collections recently, such as Undoing Border Imperialism, Life During Wartime, Uses of a Whirlwind and Sparking a Worldwide Energy Revolution. Hopefully this publishing trend continues to create intersectional cross-movement dialogs that result in strategic and tactical innovation. The stories and analysis in Grabbing Back helped contextualize our local struggle in the global flows and dynamics of capital. Coming back to Utah, I’m writing on land that was grabbed from the indigenous Ute barely a century ago. So to what extent is the so-called Global Land Grab a historically unique phenomenon? The analysis in the editor’s introduction describes the links between expanding global agricultural speculation and new pushes to extract unconventional fossil fuels. When it comes to displacing small farmers and indigenous peoples while securing profits for investors, plantation agribusiness and tar sands are different sides of the same coin. The book backs up this claim with well-researched case studies in Ethiopia, Indonesia, Paraguay, and more. So how is it to be done? Grabbing Back is not a set of policy recommendations aimed at speaking truth to power with the intent of changing the minds of politicians and technocrats. The collection is geared instead toward sharing stories and lessons between grassroots struggles. The book is divided into two sections. “Part One: Struggle in the South” is both an analytic look at the global land grab’s drivers as well as case studies of how this phenomenon is playing out, and being resisted, in Africa, South America, and Asia. Part Two moves to North America where the chapters explore conflicts around foreclosures, disaster response, gentrification, and unconventional fossil fuel extraction like tar sands, fracking, and mountaintop removal. One of the major contributions of Grabbing Back is sharing stories of current resistance from around the globe. From the Mi’kmaq blockades of fracking operations, to the 2009 overthrow of the government in Madagascar, to the incredible “mass disturbances” of contemporary China, there are certainly revolts, insurrections, and revolutions occurring globally around the question of how people will relate to land and to each other. As a whole, the collection arcs across an enormous amount of territory and some readers might find the book sprawling and circuitous. The resistance side of the narrative reads like an archipelago, each story its own island and, on the surface, it’s sometimes hard to see the details of what connects them because the described resistances are geographically, culturally, and politically disparate. The challenge and potential of this collection is whether it provides readers with the stories and analysis to understand how they are connected by common enemies: sometimes abstract, sometimes concrete. This is a valid description, and I am still hungry for prescriptive advice. How can we actually stop a tar sands mine from destroying the land we love? How can local communities and movements disrupt the ability of land grabs to take place? How do we learn to practice autogestation, or, as Javier Sethness-Castro, author of Imperiled Life: Revolution Against Climate Catastrophe (AK/IAS, 2012) writes in Grabbing Backs forward, “socio-ecological self-management.” How do we combine autogestation with an insurgent practice of militant, massive, direct action against capitalist depredation? Across the archipelago of resistance, how do we learn to act together? I found the best guidance came from articles written by movement elders whose years of experience is fertile soil to young upstarts like myself. Place-based articles like “A Detroit Story” and “Taking Back The Land” are compelling because of their keen understanding of where their struggle is happening and its inseparability from the historic moment it inhabits. However, there is no prescriptive silver bullet here, no field manual for easy victory. But there is notable insight on how the perspectives of several long-haul radicals have evolved to see intersections between struggles around class, race, gender, land, indigeneity, education, agriculture, and ecology. Other articles read like field reports from local fights against fossil fuel infrastructure, bank foreclosures, and responding to a climate disaster. To those unfamiliar with these stories, the collection is a solid introduction. To active participants in these struggles, the articles reflect the reality that there is still a great deal of learning and experimenting to happen. My hope is that readers will take from these articles the inspiration to keep fighting and to keep asking each other hard questions. We are not alone and we are indeed everywhere. We are also just beginning. This is why Grabbing Back ends with an honest acknowledgement that this is an unfinished story. Will Munger lives, loves, and works on the Colorado Plateau. He is an editor and contributor to Life During Wartime: Resisting Counterinsurgency (AK Press, 2013).